Rang-ay Bank continues to support activities of the Department of the Trade and Insdustry (DTI) as active participant in financing fora for Micro, Small & Medium Enterprises (mSME) organized DTI - La Union. Rang-ay Bank participated in the financing forum held last September 11, 2018 at the LGU Conference Hall of Balaoan La Union to promote mSME growth and development by providing business registration facilitation, advisory services and business development assistance. DTI La Union also conducted a Financing Forum last September 19, 2018 at the 4th floor of the e-Library, Agoo, La Union. Rang-ay Bank and various Micro-Small and Medium (mSME) entrepreneurs from the different municipalities in the Second District of La Union participated in the said forum. Throughout it’s more than 6 decades in countryside service, Rang-ay Bank supports the mSMEs by extending affordable Agri-business and SME Business loans to local businessmen. The bank continously develops new loan programs that cater to mSMEs thereby promoting growth and development in the communities. In 2017 alone, the bank extended P1.7Billion to mSMEs in new loans ranging from small sari-sari stores, backyard piggeries and market vendors; to subdivision developments, contract growers and building construction. An orientation for new Rang-ay Bankers was held at One Nisce Place (ONP) Events Hall, City of San Fernando, La Union on August 25, 2018. The orientation aims to instill to the new generation of Rang-ay Bankers the bank’s mission “To hasten progress in the communities of the Ilocos Region and Cordillera through accessible and affordable banking services” and its vision “Empowering North Luzon with globally competitive banking services”. The orientation also included topics such as Customer Services, Bank’s Products and Services, Financial Consumer Protection, Banking Laws, and Anti-Money Laundering Act. Twenty one (21) bankers were added to the Rang-ay Family. From Head Office, Breah Mae Costales, Jessa Maye Buentipo, Michael Dan Cariño, Frincess Ann Vergara, Vanessa Lopez, Christine Joy Acosta (Downtown), Halen Grace Jallorina (Tagudin), Melanie Hadloc (Sta. Cruz), Roseann Cabuena (Narvacan), Riezella Ann Daria (Burgos), Krys Telle Mae Borja (Bangued), Melanie Rabbon Rebuldela (Magsingal) Shiela May Alzate (Magsingal), Wella Bahingawan (Sinait), Juanito Giron Jr. (Balaoan), Joel Corpuz (Balaoan), Cheryl Caluza (Rosario), Rhona Jean Balbin (Rosales), John Bren Biazon (Bookkeeper-Dagupan), Michael Misha Mamayson (Dagupan) and Jenyca Bacani (La Trinidad). The first 24/7 Chowking Drive-Thru in La Union was formally opened last July 5, 2018 along the national highway, Sevilla, San Fernando City, La Union across Ilocos Training and Regional Medical Center (ITRMC). The inauguration and blessing started with a Mass inside the store premises officiated by Father Alex Pardo followed by cutting of the ceremonial ribbon led by San Fernando City Mayor Dong Gualberto with Ms. Denny Ortega, DoH Regional Director Valeriano Lopez, ITRMC Director Ed Badua, Chowking RBU Head Annabelle Narciso, Rang-ay Bank President Ives Nisce, Dr. Rose Nisce & PNP Supt. Arnel Marquez. Rang-ay Bank offices celebrated their anniversaries by organizing community projects in their respective communities last July and August 2018. Rang-ay Bank Burgos (Ilocos Sur) Branch celebrated its 14th anniversary last August 17, 2018 by giving "Alkansya Lata" to 110 pupils of Burgos Central School. The “Ipon ko, Bangko ko” project aims to educate the pupils on the importance of savings and to motivate them to keep earning for their future needs. Area Manager Rowena Rosales together with Burgos Branch Manager Grace Cayan and Marketing Associate Jeric Genove introduced the Kiddie Savers Program of Rang-ay Bank, which requires only a 2x2 picture plus current school ID or birth certificate for account opening. With only Php100, children 7 to12 years of age can already start saving and open their Kiddie Savers Deposit Account. 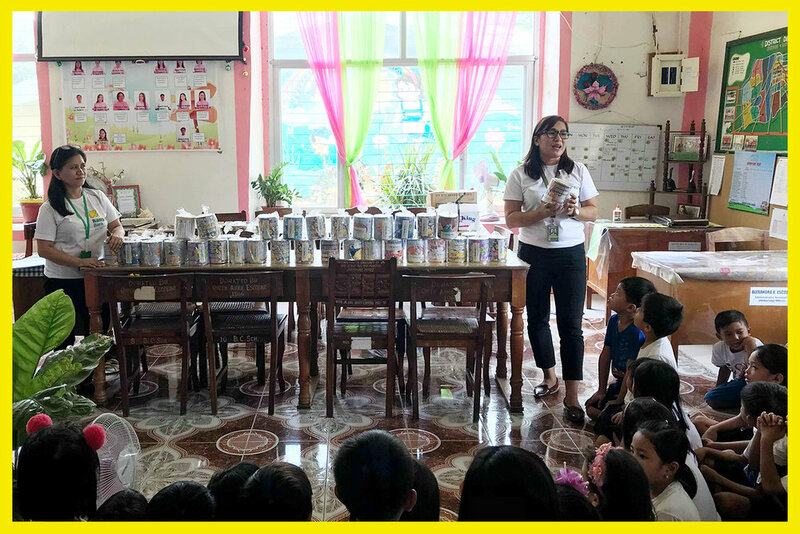 Principal Darwine Almazan together with the teachers and pupils of Burgos Central School thanked Rang-ay Bank for the alkansya lata and the opportunity for the children to start saving at their very young age. Rang-ay Bank Bacnotan (La Union) Branch celebrated its 12th Anniversary by donating bags, school supplies and providing snacks to the pupils of Day Care and Arosip Elementary School in the mountain barangay of Arosip, Bacnotan, La Union last July 10, 2018. This program provided bags and school supplies to the children which they need in learning. The bank reached the remote barangay found in the hills east of the town with the assistance of PNP Bacnotan. Day Care Teacher Editha Gadoy and Principal Ludivina Almodovar who expressed their appreciation in behalf of the pupils of Day Care and Arosip Elementary School. Rang-ay Bank Luna (La Union) Branch marked its 6th Anniversary by providing umbrellas and school supplies to the pupils of Day Care and Kinder pupils of Cabalitocan Elementary School last August 3, 2018. The project aims to provide the pupils their basic needs in learning and to educate them together with their parents and teachers the importance of savings. The event was led by Winnie Mingaracal, Area Manager together with Dominie Ledda, Luna Branch Manager and the Rang-ay Marketing Staff. 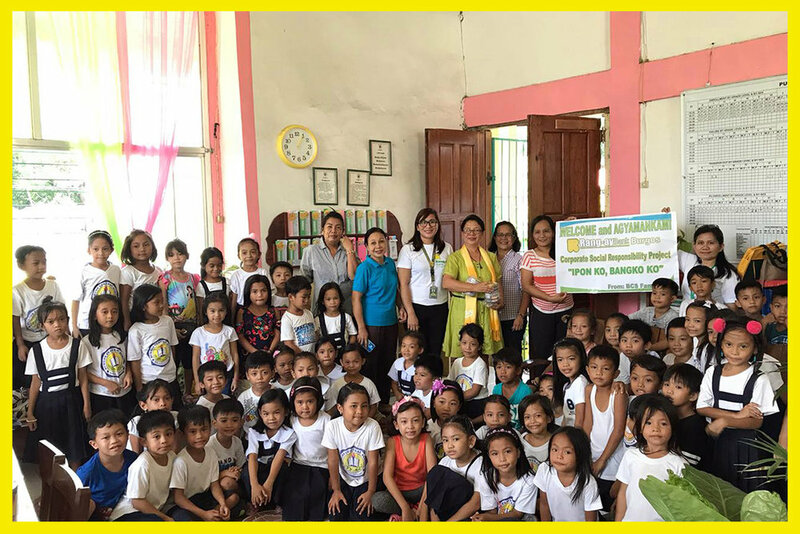 Day Care Teacher Juvelyn Lopez and Principal Marilou Cacdac expressed their appreciation in behalf of the Day Care and Cabalitocan Elementary School pupils. Rang-ay Bank Magsingal (Ilocos Sur) Branch marked it’s 10th year by donating Sporting Equipment such as basketballs, volleyballs, sepak takraw balls and badminton rackets to the Magsingal National High School last August 23, 2018. Area Manager Rowena Rosales together with Magsingal Branch Manager Brenda France Gonzales, Vigan Senior Branch Manager John Dela Cruz and Marketing Associate Lemuel Castigo introduced Rang-ay Bank and discussed the DepEd Teachers Loan Program with the teachers of Magsingal National High School. This loan program is available to public elementary and secondary school teachers and support personnel who work in the provinces of Ilocos Norte, Ilocos Sur, La Union, Abra and Benguet. Magsingal National High School Principal George Turbio expressed appreciation to Rang-ay Bank for choosing them as their beneficiary for this project. Rang-ay Bank attended the mSME Development week celebration financing forum held every July to institute continuing awareness of the primary role of small business in nation building and espouse the commitment of the State in the development of mSMEs. This year's theme is "Accelerating Mindset Change, Mastery, Mentoring, Money, Machine, Market Access and Models of Negosyo (7Ms) for Competitive mSMEs". Area Manager for Central Branches, Thelma Tabafunda with Marketing Officer Florence Joy Licudine were presentors in the financial forum on July 17, 2018 at Liga ng mga Barangay Hall, City of San Fernando La Union. The bank presented the micro, small and medium (mSME) Business Loan Program. This program is available to businessmen or entrepreneurs looking for additional working capital or credit line. This quick affordable loan program entrepreneurs looking for additional working capital or credit line. The Bangko Sentral ng Pilipinas in coordination with the La Union Bankers Association conducted a “Know Your Money Briefing” last August 9, 2018 at the 3rd floor of Bangko Sentral ng Pilipinas La Union Regional Office, San Fernando City, La Union. The briefing was attended by Rang-ay Bank Training Team Officer Alexander Ferrer and Main Branch Teller Shienna Mae Quisto. The briefing was conducted by Ms. Therese Ethel Reade Jularbal of the Economic and Financial Center who then discussed the different designs, characteristics and distinct security features of the New Generation Currency Series (Banknotes and Coins) as well as the provisions of Clean Note and Coin Policy. In order to be familiar with the New Generation Banknotes, the speaker emphasized to practice the “Feel. Look. Tilt.” Feel the paper,examine the watermark, inspect the security fiber, view the windowed and embedded security thread, check the concealed value, check the optically variable ink, check the serial number and recognize the portrait and color. The New Generation Coins features the endemic flora and fauna of the Philippines: the Kapa-kapa for 10-piso, the Tayabak for 5-piso, the Waling-waling for 1-piso, the Katmon for 25-sentimo, the Kapal-kapal Baging for 5-sentimo and the Mangkono for 1-sentimo. Laoag (Ilocos Norte) Branch celebrated its 20th Anniversary last August 21, 2018. The branch staff, led by Senior Manager Jeanette Racoma conducted a coastal clean-up drive and donated garbage cans to Brgy. Lapaz, Laoag City, Ilocos Norte with the theme "Let’s Protect and be ECO-nnected" in coordination with Ilocos Norte Regional School of Fisheries. The project aims to help the province in the restoration of our natural resources. Barangay Chairman Estelito Antonio together with the Officer in Charge(OIC) Barangay Chairman Ronie Alejandro, SK Chairman John Paul Piñera, Pantawid Pamilyang Pilipino Program (4Ps) head of Brgy. La Paz Noralyn Ventura and Mio Owners Republic Laoag Chapter President Rafael Ragasa expressed their appreciation to Rang-ay Bank for working with them in implementing the clean-up project.